Most everything in this section was tested in the GMAT, so my review will be brief. If your algebra skills are week, I strongly suggest that you find an old textbook and work practice problems. As a former calculus tutor, I can say that most “calculus problems” actually stem from poor algebra skills. An equation is a statement that two expressions are equal. Solving the equation is the process of finding all values of the variables such that the equation is true. Linear equations are ubiquitous in economics, operations management, and other business disciplines. It is no surprise that they have their own section in this review. Probably the next most commonly encountered type of equation, after linear equations, is the quadratic equation. These equations have the general form ax2 + bx + c = 0. Because a quadratic is a second order equation, it has two solutions. Note, however, that these solutions are not necessarily real numbers. There are several techniques for solving quadratics. In the “real world” you would probably solve them by graphing them or sticking them in a spreadsheet and using the solver. 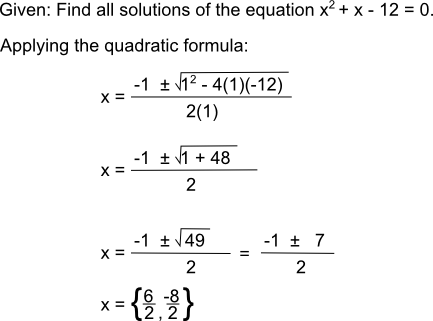 For this test, however, you need to know how to solve quadratics by factoring and by using the quadratic formula. Factoring is the process of breaking an expression into simpler terms that multiply together to produce the original expression. The solutions are therefore x = -4, and x = 3, because either (x + 4) or (x – 3) must evaluate to 0 in order for the equation to be true. The acronym FOIL is a useful mnemonic for remembering how to factor these equations. It stand for First, Outer, Inner, Last. Sometimes the equation is simple enough that we can figure out the FOIL coefficients in our head. Other times, a more formal approach is warranted. 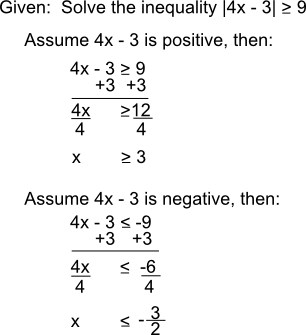 This approach is called the “AC method” or “grouping method in Algebra texts. As an example, consider the equation 6x2 + 5x – 4 = 0. Multiplying the A and C terms gives us A • C = 6 • -4 = -24. The factors -3 and 8 add up to 5, which is our B coefficient. Many quadratic equations are simply too messy to solve by factoring. For instance, they might include decimals and/or rational numbers, or the solutions might be complex numbers. Luckily, we have a “brute force” method that always works: the quadratic formula. Inequalities are like equations but a <, >, <, or > replacing the = sign. Inequalities are solved just like equations, with one important difference. Whenever you multiply or divide an inequality by a negative number, reverse the direction of the inequality. Blitzer, R. (2006). Introductory Algebra [4th Ed.]. Upper Saddle River, NJ: Pearson.